Research has linked over-the-counter (OTC) cough and cold products to cases of poisoning or death in hundreds of children 2 years and younger. In addition, studies have shown that these medicines do little to control symptoms. In 2008, the US Food and Drug Administration (FDA) formally recommended that OTC cough and cold products not be used for children in this high-risk age group. However, little is known about whether parents and children’s health care providers have adopted the FDA’s recommendations about these medicines. Among parents with children 2 years and under, 61% have given their children OTC cough and cold medicines within the last 12 months. Use of such medicines differs by race/ethnicity—higher among black (80%) and Hispanic (69%) than among white parents (57%). Use also differs by income—highest (80%) in families with annual income <$30,000 and lowest (41%) in families with income of $100,000 or more. Use is not different if the parent had older children at home. When deciding whether to use an OTC medicine, two-thirds of parents report wanting their child to be able to sleep better or to be more comfortable during the day as “very important” reasons. 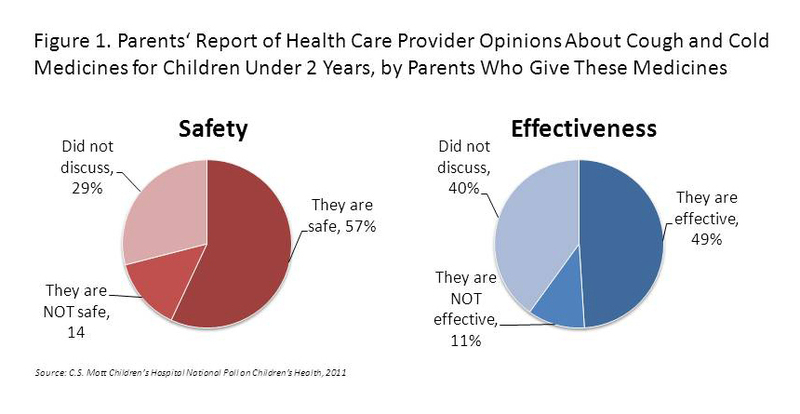 Over half (56%) say having their child’s health care provider recommend the medicine was very important. Among parents who have used OTC cough and cold medicines for their young children, 57% say their children’s health care providers indicated that these types of medicines are safe. 49% of parents say their children’s health care providers indicated that OTC cough and cold medicines are effective in young children (Figure 1). 6 in 10 parents of children 2 and under gave their children over-the-counter cough and cold medicine within the last 12 months. About half of parents who use OTC cough and cold medicine report that their young children’s health care providers say these types of medicines are safe and are effective. FDA warnings about OTC cough and cold medicines prompted a voluntary recall of products marketed for children younger than 2 years. However, this latest poll indicates that the FDA warnings have gone unheeded by the majority of parents. There are challenges to informing parents about this topic. The FDA warning is specific to young children 2 and under—but parents of those kids may not have heard the warnings issued more than 2 years ago. Each year a “new generation” of parents must be educated about a wide variety of health care issues for their children. Logically, many parents look to their children’s health care providers as a source of timely health information. However, in this poll, about half of parents report that their young children’s health care providers say that OTC medicines are safe and effective. Further work is needed to verify that child health care providers understand FDA warnings about OTC cough and cold medicines, and to ensure that health care providers are giving parents clear and consistent messages about these medicines’ safety and effectiveness. This report presents findings from a nationally representative household survey conducted exclusively by Knowledge Networks, Inc, for C.S. Mott Children’s Hospital via a method used in many published studies. The survey was administered in January 2011 to a randomly selected, stratified group of parents aged 18 and older with children age 6 months to 2 years (n=349) from the Knowledge Networks standing panel that closely resembles the U.S. population. The sample was subsequently weighted to reflect population figures from the Census Bureau. The survey completion rate was 60% among parent panel members contacted to participate. The margin of sampling error is plus or minus 5 to 15 percentage points. This Report includes research findings from the C.S. Mott Children's Hospital National Poll on Children's Health, which do not represent the opinions of the investigators or the opinions of the University of Michigan. Davis MM, Singer DC, Butchart AT, Clark SJ. Despite warnings, parents continue to use cough & cold medicines for young kids. C.S. Mott Children’s Hospital National Poll on Children’s Health, University of Michigan. Vol 12, Issue 1, February 2011. Available at: http://mottpoll.org/reports-surveys/despite-warnings-parents-continue-use-cough-cold-medicines-young-kids.